The son of an English practising Christian mother and Muslim father, Jim was born and raised in Iraq, but left that country with his family in 1979 to come to England at the age of 16. His academic career has been in theoretical physics but he is best known publically as a popular and accomplished science communicator, whose books have been translated into over 20 languages. In spite of his parentage and his descent from an Iraqi Ayatollah, Jim has been a humanist since his teenage years. Jim Al-Khalili, accepting the appointment, said, ‘I am excited to be the BHA’s next President. It’s a real honour and I hope I can do the position justice, especially when I look back on some of its illustrious past presidents. Following from Polly Toynbee is a particularly daunting prospect as she has been such an influential and respected voice in British intellectual life over several decades. Her uncompromising stance on secularism and social democracy have been exemplary and I know she leaves the post with the BHA stronger than it has ever been in its 116-year history. ‘Like so many people who are not religious, I have often felt offended by the misguided notion that people require a religious faith to provide their moral compass in order to lead a good life. Reason, decency, tolerance, empathy and hope are human traits that we should aspire to, not because we seek reward of eternal life or because we fear the punishment of a supernatural being, but because they define our humanity. Only in recent years have I come to appreciate that all those qualities I have tried to espouse are precisely what defines Humanism. Previous Presidents of the British Humanist Association have included jazz musician and author George Melly, agony aunt and broadcaster Claire Rayner, comedian and broadcaster Linda Smith, cosmologist Hermann Bondi, anthropologist Edmund Leach, and evolutionary biologist Julian Huxley. On departing as President, Polly Toynbee will join distinguished humanists such as philosophers Simon Blackburn and Richard Norman, and scientists Lewis Wolpert and Richard Dawkins as a Vice President of the BHA. 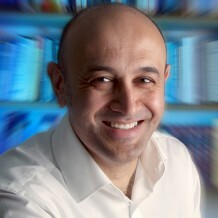 Professor Jim Al-Khalili OBE is professor of Physics and professor of Public Engagement in Science at the University of Surrey. His academic career in theoretical nuclear physics began with a postdoctoral research fellowship at University College London, after which he returned to the University of Surrey, where he was appointed as a lecturer in 1992 and where he continues to teach and conduct his research in quantum physics. He is a Fellow of the Institute of Physics and an Honorary Fellow of the British Science Association. He has been a Senior Adviser to the British Council, Vice President of the British Science Association and a past judge on both the Samuel Johnson book prize and the Art Fund prize. Jim is best known to the public as a popular science broadcaster and author and was the youngest ever recipient of the Royal Society Michael Faraday Prize for science communication in 2008. His books have been translated into over 20 languages and include Black Holes, Wormholes and Time Machines, Nucleus: A Trip into the Heart of Matter, Quantum: A Guide for the Perplexed, Pathfinders: The Golden Age of Arabic Science, Paradox: Nine Great Enigmas in Physics and the forthcoming Quantum Life: How Fundamental Physics is Revolutionising Biology. His television series include Shock and Awe: The History of Electricity, Atom, The Big Bang, Chemistry: A Volatile History (BAFTA nominated), and Science and Islam. He is the presenter of BBC Radio 4’s weekly programme, The Life Scientific. The great-great grandson of an Ayatollah from the city of Najaf, and the child of a devout English protestant mother and a Shia Muslim father, Jim was born and raised in Iraq, but left that country with his parents in 1979. He lives with his wife, Julie, in Southsea and has two grown up children at university. Founded in 1896 as the Union of Ethical Societies, the British Humanist Association (BHA) works for a world where everyone lives cooperatively on the basis of shared human values and respect for human rights and where non-religious people are confident in living ethical and fulfilling lives on the basis of reason and humanity. 30,000 members and supporters and over 60 local and special interest affiliates trust us to promote Humanism; provide services, support and representation to the non-religious; and promote a secular state and equal treatment in law and policy of everyone, regardless of religion or belief. Our hundreds of trained and accredited celebrants conduct funerals and other non-religious ceremonies attended by over hundreds of thousands of people each year.